Gackt, Hartnett, Harrelson star in "Bunraku"
The Japanese puppet theater known as bunraku is an art form in which three puppeteers manipulate large puppets on stage. The origins of bunraku are rooted in the 10th or 11th century, when traveling entertainers performed puppet plays to audiences in Osaka and Kyoto. The art form was perfected in Osaka during the 1600s, when joruri (chanted narration) and musical accompaniment by the shamisen (Japanese three-stringed, banjo-like instrument) were added. 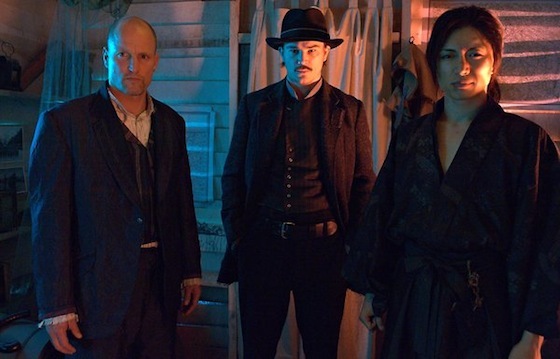 Bunraku the movie tells the tale of three men, – a drifter (Josh Hartnett), a samurai (Gackt), and a bartender (Woody Harrelson) – each on a personal quest for revenge. The film is the brainchild of Israeli writer/director Guy Moshe, who combines comic books, spaghetti westerns, samurai films, and video games to create a visually dynamic future world terrorized by a ruthless leader (Ron Perlman) and his tyrannical regime. J-pop culture fans are psyched about seeing Japanese superstar Gackt in his international film debut in Bunraku. The singer/actor portrayed a heroic warlord in the Japanese historic drama Fuurin Kazan. Bunraku the movie opens today (September 30) and is playing at AMC Empire 25 on 42nd Street (between 7th and 8th Avenues).